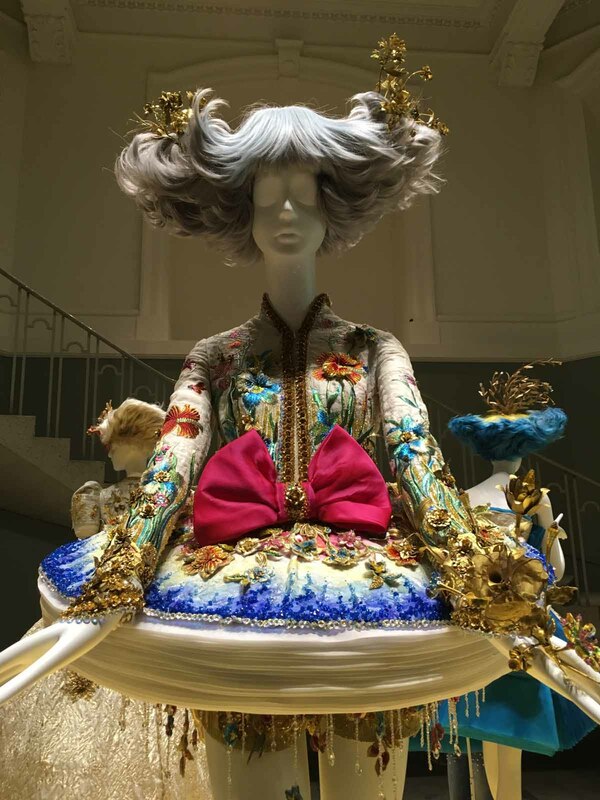 The Vancouver Art Gallery gets theatrical, thanks to Guo Pei. In October, the Autumn colours in greater Vancouver are exuberant and vivid. The whole city is ablaze in crimson, saffron and golden yellow, with dramatic contrasts against glass and grey architecture and shifting skies. 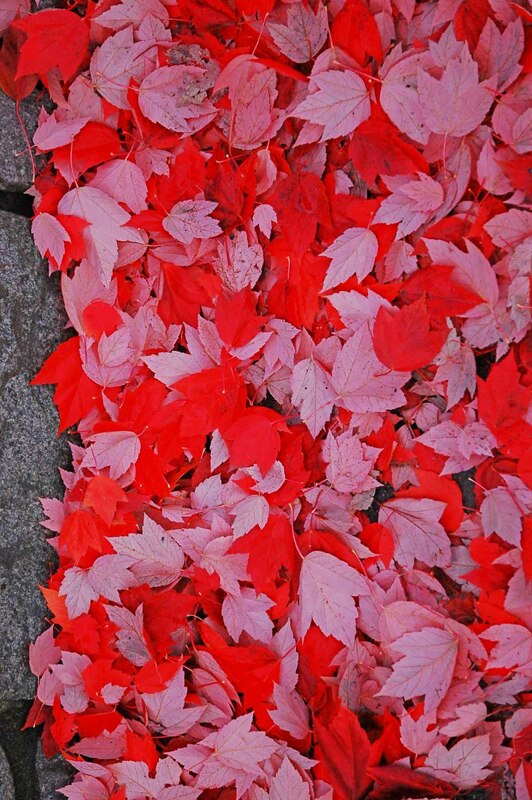 Autumn is sensual, vivacious and uplifting. If Autumn were a movie star it would be Marilyn Monroe. These dramatic contrasts are carried on inside through the current exhibition at the Vancouver Art Gallery; Couture Beyond. 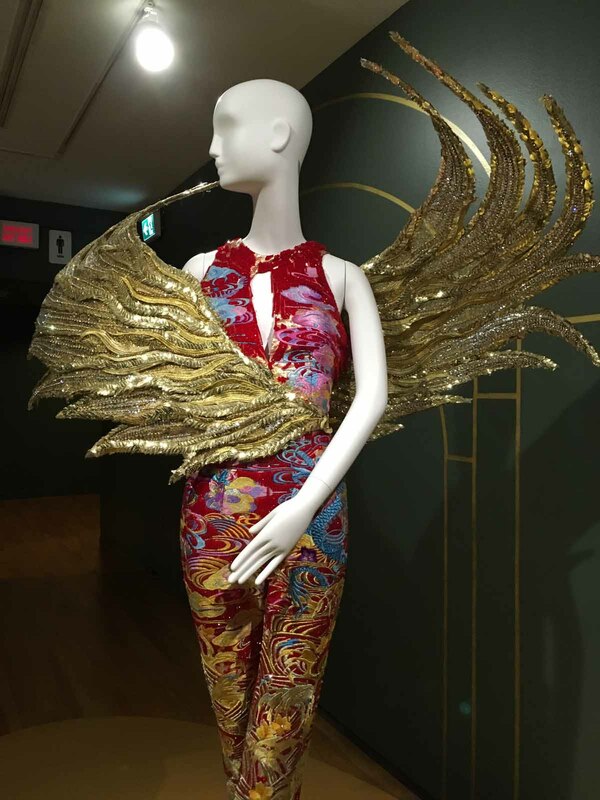 I spent a full day at the Vancouver Art Gallery enjoying the whimsical and exquisite retrospective of Chinese couturier, Guo Pei. Guo Pei is a Chinese fashion designer. She is best known for designing dresses for Chinese celebrities, and in America for Rihanna’s trailing yellow gown at the 2015 Met Ball. Couture Beyond is the perfect title for this exhibit. 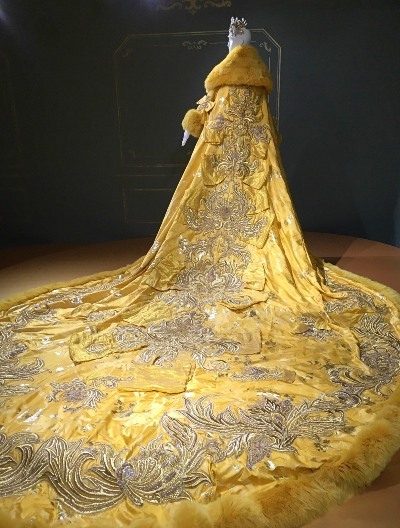 The first Canadian exhibition devoted to the work of Guo Pei, China’s preeminent couturière. This mid-career survey features more than forty complete looks from Guo Pei’s most iconic runways from 2006 to 2017. In her theatrical, extravagant creations, Guo Pei combines contemporary aesthetics, production methods and materials with ancient tradition, evoking Chinese history and mythology in her craft techniques, fabric selection and imagery. The exhibition provides a comprehensive overview of her evolution as a designer as well as her contribution to global fashion culture. 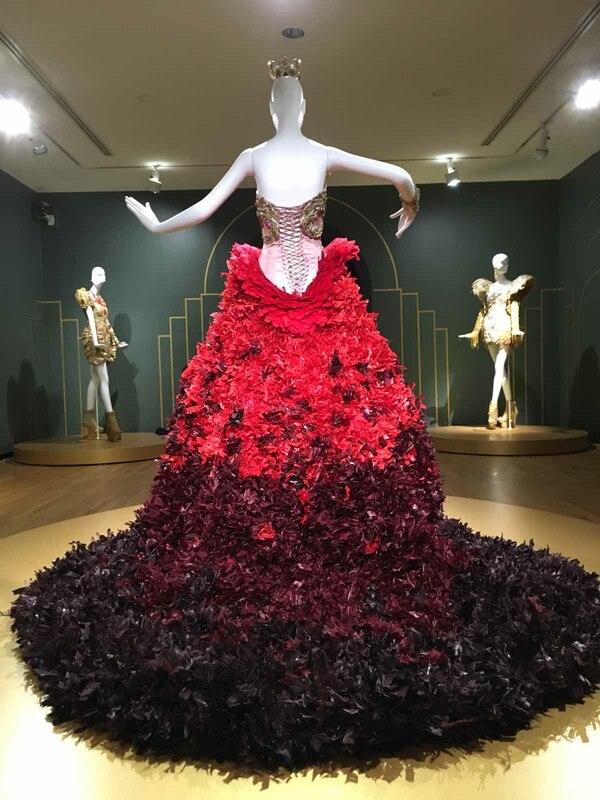 The exhibit includes works created for the Met Ball, the Metropolitan Museum of Art fashion fundraiser that happens annually in New York City. If you are in or near Vancouver, go see the show! Many of the pieces in this show appealed to my surreal tendencies found throughout my paintings. In particular I see commonalities with my ‘Portraits of the Landscape’ series, new paintings I have been working on for the past couple years. With ‘Yin Rising’ (below) this portrait of a landscape expresses the human connection to nature and particularly the feminine in nature. At the center of the piece the beautiful Magnolia flowering, representing purity, nobility, perseverance, dignity and a love of nature. 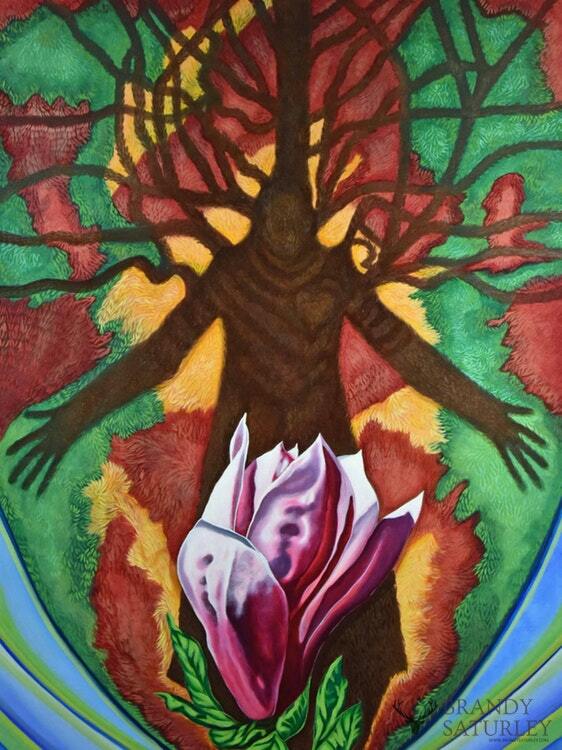 A shadowy figure that blends human and nature using tree symbolism. The painting expresses many things about our connection to nature and many elements and symbols are hidden within the painting. The abstract forms created by the colours of the background create many shapes, that add to the overall narrative of the piece. A painting that holds something new to discover each day, there are many layers to this piece, not unlike the beautiful couture creations of Guo Pei. With Canadian Subconscious, again you can see strong symbolism, femininity and our relationships to nature in Canada. 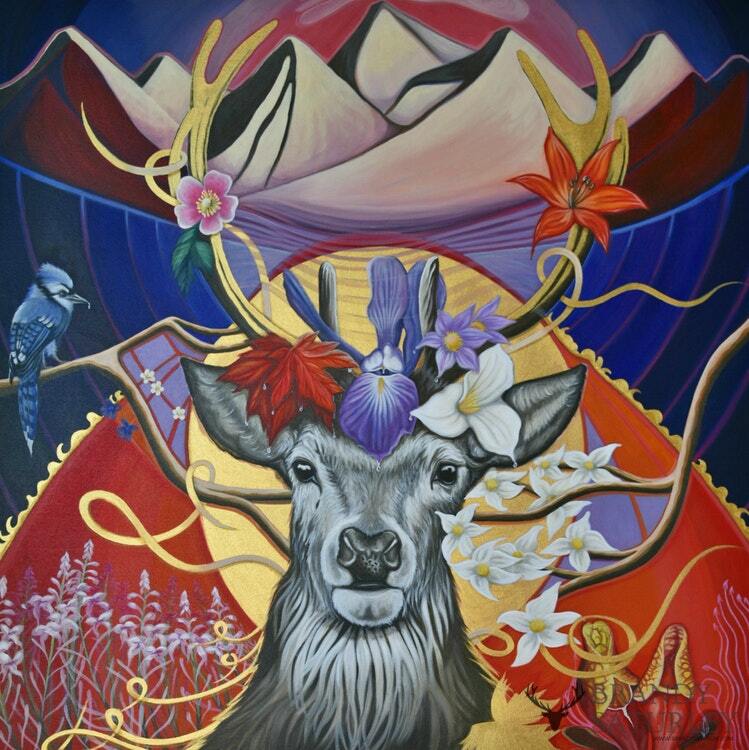 This painting features many of the provincial flowers of Canada, as well as the Blue Jay and the black-tailed deer stag. The relationship of ecosystems, mindful of our connection to nature and the natural world, with vivid palette and gold accents, it’s couture on the canvas.